RP national junior team member Luis Miguel "Igi" Maximo takes to the road once again as he competes for Cebu in the Philippine Duathlon series today at Daang Hari, Manila. The event is the biggest duathlon event in the country, with more than 500 multisport athletes chasing the coveted titles and bragging rights. It is sponsored by Powerade and organized by Adrenaline Multisport Group headed by Thumbie Remigio. 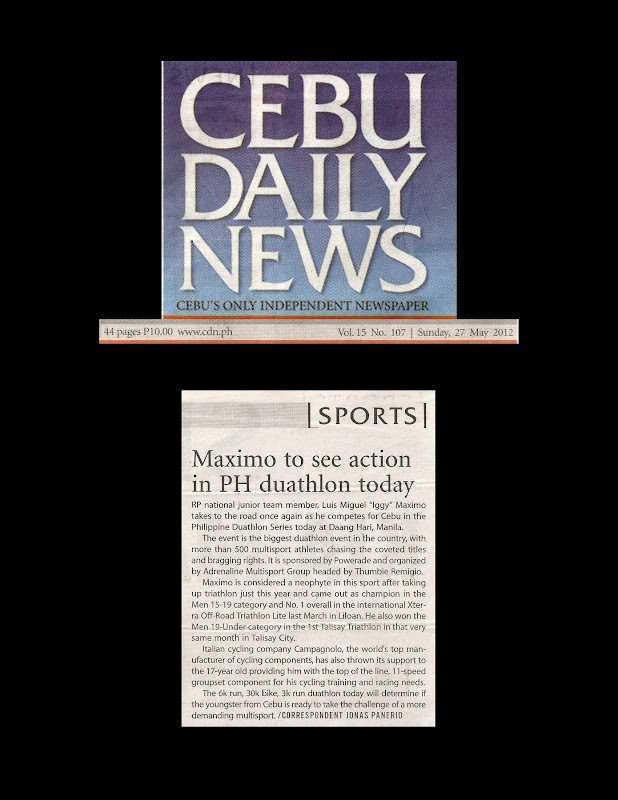 Maximo is considered a neophyte in this sport after taking up triathlon just this year and came out as champion in the Men 15-19 category and No. 1 overall in the international Xterra Off-Road Triathlon Lite last March in Liloan. He also won the Men 19-Under category in the 1st Talisay Triathlon in that very same month in Talisay City. Italian cycling company Campagnolo, the world's top manufacturer of cycling components, has also thrown its support to the 17-year old by providing him with the top of the line, 11-speed groupset component for his cycling training and racing needs.